This project requires requires an individual with Machine learning background and an ability to explain complex concepts in simple terms.. and create easy to follow graphics to visually explain the concept. 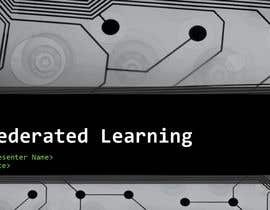 Im would like to develop a power point presentation (6 to 12 slides) explaining Federated Learning. Originally conceived by google for mobile phone, this presentation should be focused on internet of things(IOT). Hello CH. I am a qualified IT expert and have been working with AI tech for over 5 years, and have graphics designing expertise and well. Just wanted to let you know that I will be submitting an entry soon. Cheers. I keep saying that this requires a machine learning subject matter expert with a special ability. 1: able to grasp the concept 2: the ability to simplify complex concepts so anyone can understand it. I do not have the time to collaborate, to work with an illustrator to get this done. It might be that this is not doable in this forum without a dedicated person to help with the content. Im not looking for a ppt expert that can sit with me and collaborate on creating this. 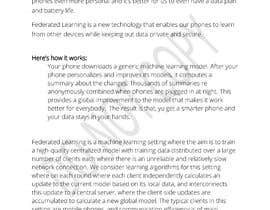 Im also not asking for an illustrator to learn Federated Learning so they can do the job. Its too much work not enough money; you need the background for this to work. I believe the key is how you depict Federated learning in a graphic design.. most of what Ive seen is the Google graphics with the phones. CH, This is not about expertise or rejecting irrelevant entries like a ‘sample presentation’ or plagiarized entry posted from the web. Its about clearly stating project brief and topics for a complex concept so that both the CH and the contestants are on the same page as far as deliverable go. 1. Clearly stating requirements, not a generic statement for a vast and complex concept because even an expert in the field will need directions on what exact topics to cover in about 6-12 slides, so feedback on a relevant entry matters. 2. ‘RATING’ relevant entries for contestants to understand how close they are in meeting the CH’s expectations. 3. ‘FEEDBACK’ to improve their entries and to understand if they are going in the right direction..
A person that doesnt have a background in machine learning will have a difficult time or it will require a lot of research... I thought I was clear about the expertise required to do the job. Kushal thank you for your feedback, the issue isn't that Im not sure of what Im looking for... 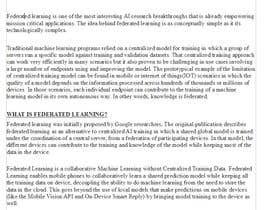 This is a very complex topic which I stated required someone who understand Machine Learning and is able to interpret the information in a noncomplex way. Most of the entries just copied the google page info and turn it into a PPT. The images were wrong and the information typed in was incorrect. I do appreciate all the attempts made by freelancers but if the information or the attempt is incorrect I cant award. This is a project about interpreting complex concept in away that is easy to follow by any person. Hey CH, He is my take – It seems like you are not really sure on what exactly you are looking for ?? you received 3 different entries so far from freelancers who spent a lot of time designing for you, however you rejected all entries without letting us know what you’re precisely looking for (no rating or feedback) - your requirements in the project description is just a standard definition of the subject found on the Internet and is a very generic statement explaining the subject in Google terms and does not depict any knowledge whatsoever on the subject. Clearly Stating your project needs, for example: whether you need broad concepts, SGD, APIs, algorithms, calculations, examples, main topics for the slides, etc is vital for precise and expected delivery. Effective communication is key on this platform for freelancers to be able to deliver what an employer needs OR else your money and the contestants' time is wasted. I will be able to tell by the drawing of how federated learning works if you understand the concept. Are you looking for an elaborated summary in a form of PPT which explains he topic or an in-depth detail of how its works? No I need someone to look at the information on Federated Learning (available on the Web) and create a PPT presentation . I think this will require two jobs 1: a person to read the technical information and interpret in an easy to follow presentation 2: a graphics designer to add the images. Can you clarify exactly what you want. Do you have the information that is going to go on the presentation? Are you looking for just the graphics?